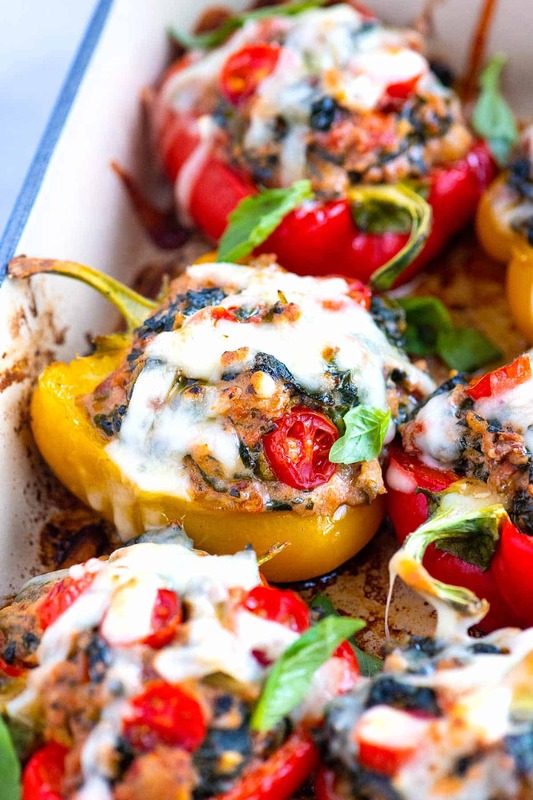 Easy sausage stuffed peppers with spinach, ricotta cheese, and tomatoes. Thanks to chicken sausage, these stuffed peppers are hearty, flavorful, and simple to make. Jump to the Easy Sausage Stuffed Peppers Recipe or read on to see our tips for making them. 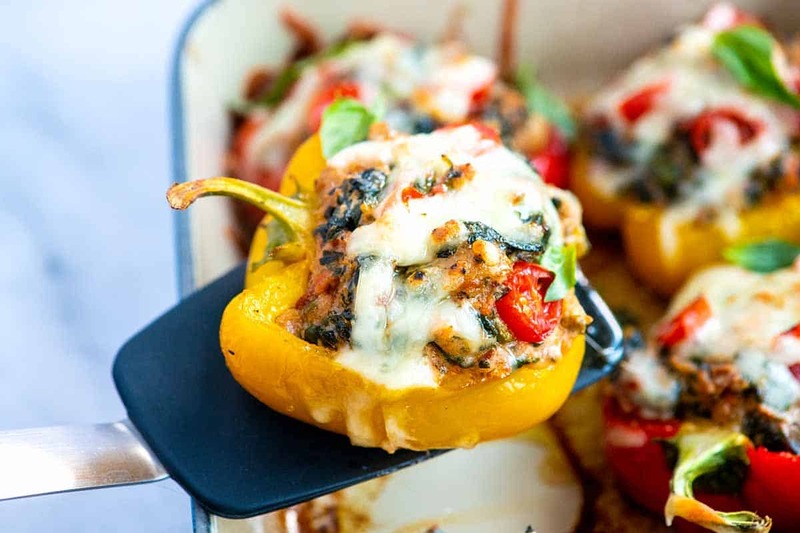 Stuffed peppers are an excellent option for dinner. Halved bell peppers are hollowed out and filled with some of our favorite ingredients. You can stuff peppers with just about anything — vegetables, rice, meat, and cheese being common. For these easy stuffed peppers, we fill bell pepper halves with a combination of chicken sausage, diced tomatoes, garlic, and ricotta cheese. The recipe is inspired by this sausage and spinach stuffed shells recipe. The filling is the same. 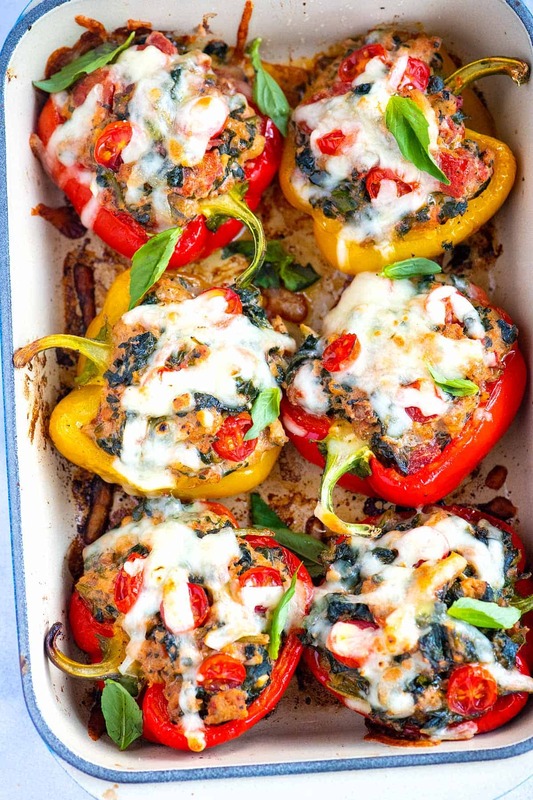 Here’s another stuffed peppers recipe that’s vegetarian with tomatoes and basil. Peppers — In the photos, we are using sweet bell peppers (any color works). For a spicier version, try poblano peppers instead. Sausage — In our stuffed shells recipe, we use pork sausage, which tastes fantastic. 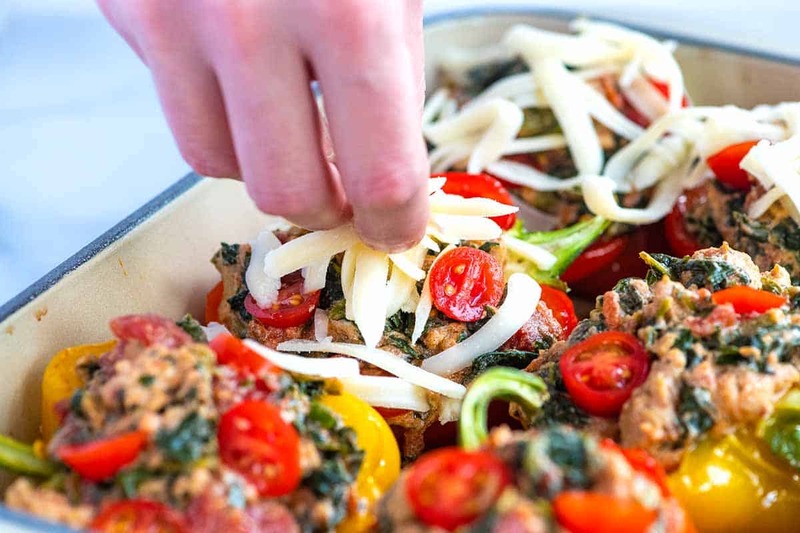 To make these stuffed peppers a little lighter on calories, we swap the pork sausage for chicken sausage. The type of sausage you use is up to you. Chicken, turkey, pork, Italian-style, and spicy sausage are all great options. 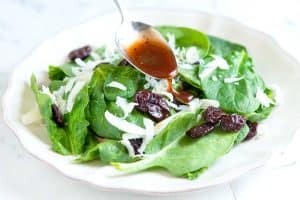 Spinach — Both fresh and frozen spinach will work. 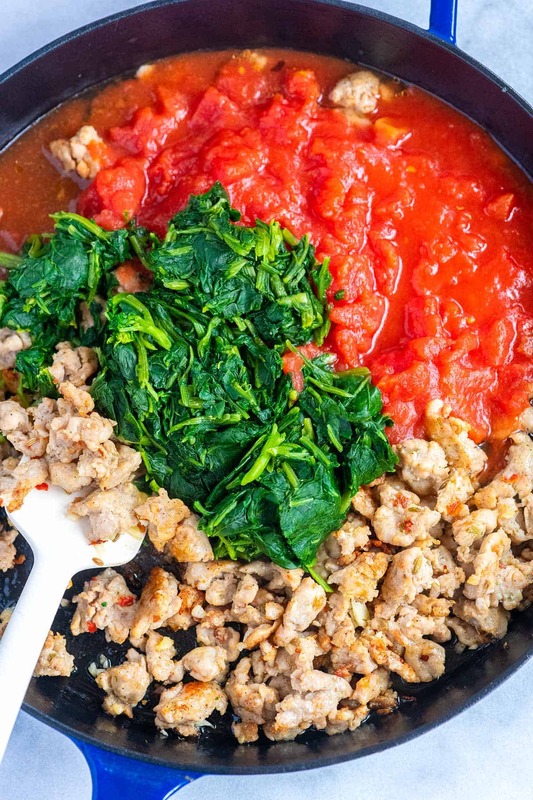 Fresh spinach leaves can be stirred into the sausage mixture and cooked until wilted. Frozen spinach should be thawed first and then squeezed dry of excess liquid before adding to the sausage. Garlic — Depending on the sausage you use, there may already be garlic in the pan. That said, we always add a couple of extra minced cloves for a bit more spice. Tomatoes — One can of diced tomatoes does the trick for the filling, but you can use fresh tomatoes if you have them on hand. Ricotta cheese — Not only does ricotta add flavor and a richness to the filling, but it also binds it together, so nothing falls out of the peppers when they bake. Mozzarella cheese — A small scattering of cheese on top of the peppers is a nice touch. As the peppers bake, the cheese melts and browns. By the way, you might notice that in our photos there are some sliced cherry tomatoes. We love it when you can immediately tell what’s in the food you are about to eat, so when we have them on hand, we add a few slices to the top of the peppers. It does make them pretty, but they are not necessary. There’s also fresh basil, which is a nice touch. Cut the peppers in half and scoop out the seeds. Drizzle with a tiny bit of olive oil and season with salt and pepper. Line the peppers up, cut-side-down in a baking dish. Slide into the oven and turn the heat to 350 degrees Fahrenheit. The peppers will roast by themselves while we make the filling. This step replaces blanching the peppers, which is a step often found in stuffed pepper recipes. Make the filling by browning the sausage in a skillet on the stovetop. When brown, stir in the garlic, spinach, and tomatoes. Cook until the liquid from the spinach and tomatoes has thickened then stir in the ricotta cheese. Take the peppers out of the oven, flip them so that the open cavity is facing up, and then divide the filling between the pepper halves. Top with mozzarella cheese. Bake for 20 minutes or until the cheese on the top has melted, and the peppers are soft. Since the filling is cooked before we add it to the peppers there are two options for making the recipe ahead of time. 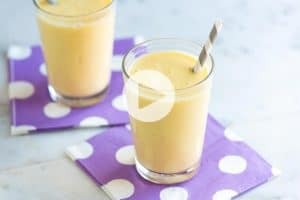 The filling can be made in advance and kept, tightly covered, in the refrigerator 3 to 4 days. Peppers can be stuffed and baked then kept, tightly covered, in the refrigerator 3 to 4 days. Peppers can be stuffed and then frozen individually for up to a month. Bake from frozen until heated through, which should take just over an hour in a 350-degree Fahrenheit oven. 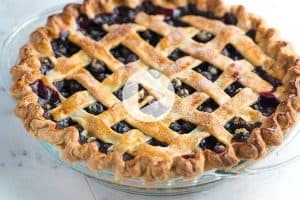 You can also thaw them overnight in the refrigerator and bake the next day, which will take a little less time in the oven. Thanks to chicken sausage, these easy stuffed peppers are hearty, flavorful, and simple to make. Instead of blanching the peppers before filling them, we place them into the oven while it heats up. As the oven heats up, make the filling. Slice the peppers in half through the stem. Scoop out the seeds and discard. Rub the pepper halves inside and out with a teaspoon of olive oil and season with salt and pepper. Place the pepper halves, cut-side-down in one layer in a baking dish. Place into the oven then heat the oven to 350 degrees Fahrenheit. Meanwhile, heat a wide skillet over medium-high heat. Add a teaspoon or so of olive oil and the sausage and cook until browned, about 10 minutes. As the sausage cooks, use a wooden spoon to break the sausage up into small pieces in the pan. Stir in the garlic and red pepper flakes (if using) and cook for one minute. Add the tomatoes, as well as the thawed and ringed out spinach. Cook until heated through and the liquid has reduced by half, about 2 minutes. Remove the pan from the heat then stir in the ricotta cheese. Taste for seasoning, and then adjust with salt and pepper if needed. Remove the baking dish with peppers from the oven. Flip the peppers then divide the filling between them (about 1/2 cup of filling per pepper half). Top peppers with mozzarella cheese then bake until the cheese melts, and the peppers are soft; about 20 minutes. Sausage: Look for uncooked chicken, turkey or pork sausage for this. Depending on the store, you can find bulk sausage. 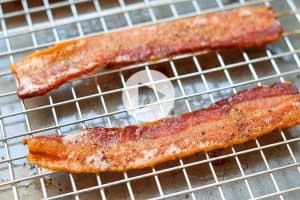 If you cannot and instead buy sausage formed into links, remove the casings by cutting a slit down the sausage and pulling the casing away from the meat. If you cannot find chicken or turkey sausage, ground chicken or turkey work. Consider adding a few extra spices to replicate the flavor of the sausage. We recommend 1/2 to 1 teaspoon ground fennel, 1/4 to 1/2 teaspoon black pepper, an extra clove of garlic, and a pinch of crushed red pepper flakes (dried basil, Italian seasoning, and paprika are also great options). Substitute 1 1/2 pounds fresh spinach for the frozen spinach and add the fresh spinach directly into the pan with browned sausage.